The Inter-American Court of Human Rights (IACtHR) examined for the first time the issue of informed consent to medical treatment and forced sterilization, in its judgment in I.V. v. Bolivia, released last week. [IACtHR Press Release (in Spanish)] The case involves a Peruvian refugee who was sterilized by a tubal ligation performed without her informed consent in a Bolivian public hospital in 2000, resulting in permanent loss of her ability to conceive a child. See I/A Court H.R., I.V. v. Bolivia. Preliminary Objections, Merits, Reparations and Costs. Judgment of 30 November 2016. Series C No. 329, paras. 64-65 (in Spanish). I.V. had been admitted to a public hospital to give birth and was sterilized, immediately after doctors performed a Caesarean section, purportedly to prevent potential complications if I.V. were to become pregnant again in the future. See id. at paras. 63-64. The IACtHR’s judgment expands the Court’s jurisprudence on the principle of informed consent, the (infrequently cited) right to dignity under the American Convention on Human Rights, and a State’s obligation to ensure adequate training for medical professionals. The IACtHR affirmed that informed consent is an essential precondition to medical treatment that is based on respect for individuals’ autonomy, dignity, and freedom to make their own decisions. See id. at para. 159. 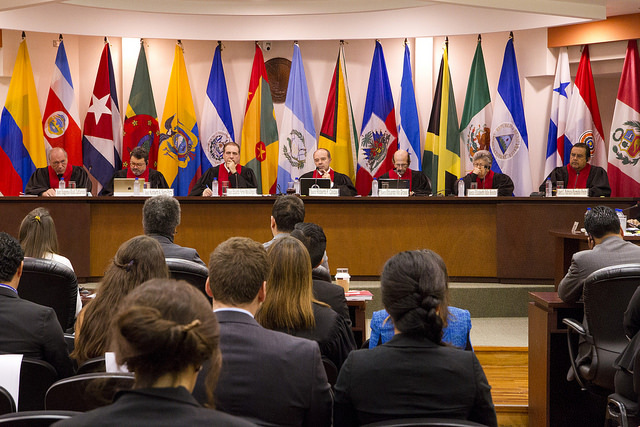 The International Justice Resource Center (IJRC), together with the International Human Rights Clinic at Santa Clara University, submitted an amicus curiae brief to the Court which provided supplementary analysis on these concepts and the human rights implicated by forced sterilization of women, a practice that is regrettably common in the Americas and throughout the world. The IACtHR’s judgment examined the parties’ allegations with respect to articles 3 (juridical personality), 5.1. (personal integrity), 5.2. (torture or cruel treatment), 7.1. (personal liberty and security), 8.1 (due process), 11.1 (respect for honor and dignity), 11.2 (private and family life), 13.1 (freedom of thought and expression), 17.2 (marry and raise a family), 25.1 (judicial protection), and 25(2)(a) (a remedy) of the American Convention on Human Rights, as well as article 7(a) (refrain from engaging in violence against women) and (b) (prevent and investigate violence against women) of the Inter-American Convention on the Prevention, Punishment, and Eradication of Violence against Women (Convention of Belém do Pará). The Court unanimously found Bolivia internationally responsible for violating all of these protections, except for that it declined to make a determination regarding articles 3 and 25(2)(a) of the American Convention and the “right to truth.” Its conclusions rested on the State’s responsibility to respect I.V.’s rights in its public hospitals, its duty to prevent such violations through its regulation of health care providers, and its obligation not to discriminate on the basis of gender. Its analysis heavily referenced statements and findings from other supranational human rights bodies, including the United Nations treaty bodies and European Court of Human Rights, that have addressed forced sterilization or women’s reproductive rights. While the Court did not explicitly indicate it was adopting a holistic methodology in analyzing the rights implicated by forced sterilization, it did consider the allegations in three groups of rights, related to: informed consent (including personal integrity, liberty, dignity, privacy and family life, and access to information), torture or cruel treatment, and judicial protection. This analysis is in line with the approach urged by the International Human Rights Clinic at Santa Clara University and IJRC in our amicus curiae brief, in which we suggested that that the Court replicate its process in forced disappearance cases and collectively analyze the alleged violations of articles 5, 11, 13, and 17 of the American Convention and Article 7 of the Convention of Belém do Pará in any forced sterilization case (and separately decide, on a case-by-case basis, whether the due process and judicial protection provisions of articles 8 and 25 of the American Convention had also been violated). The judgment collectively analyzed the rights to physical, mental, and moral integrity; personal liberty and security; dignity; privacy; access to information; and to raise a family, in its discussion of informed consent and whether the sterilization itself violated international norms. See id. at paras. 118, 148-64. The Court found that Bolivia did not meet its international obligations with respect to these rights and also found the State in violation of Article 7 of the Convention of Belém do Pará, which places a duty to refrain from any practice or act of violence against women. See id. at para. 118. With respect to the right to dignity, which has not been the subject of extensive prior analysis by the Court, the IACtHR noted that Article 11(1) of the American Convention, which states that every individual has “the right to have his honor respected and his dignity recognized,” protects one of the most fundamental human values. See id. at para. 149. The Court highlighted the relationship between the right to dignity as established in Article 11 and the principle of individual autonomy, which limits State action that restricts a person’s ability to make decisions over his or her life, body, or personal development. See id. at para. 150. It emphasized the close and intrinsic links between the rights to dignity, privacy, family life, personal integrity, health, and access to information. See id. at paras. 150-55. Based on international law, the IACtHR concluded that informed consent is an ethical and legal obligation of health professionals and States must ensure it is obtained prior to any medical procedure “since it is based principally in the autonomy and self-determination of the individual, as part of the duty to respect guarantee the dignity of every human being, as well as the right to liberty.” See id. at para. 164-65 (informal translation by IJRC). The IACtHR interpreted the scope of informed consent and determined the parameters necessary to analyze whether a State’s action is in violation of international human rights standards. See id. at para. 147. The Court defined informed consent as the positive decision to undergo a medical act, derived from a previous, free and informed decision or process, that involves an interaction between the doctor and the patient, through which the patient actively participates in the decision making process, moving away from the paternalistic approach of medicine and focusing on individual autonomy. See id. at para. 166. In analyzing the issue of informed consent, the IACtHR specifically referenced the doctor-patient relationship noting in particular the power imbalance between the two. See id. at para. 160. It recognized that informed consent, as an expression of a person’s autonomy in the health field, changes the paradigm in the doctor-patient relationship, allowing a patient to make decisions freely, without any form of violence, coercion, or discrimination. See id. at para. 161. The Court articulated three elements of informed consent: that it is granted prior to initiating any medical act; that it is provided freely, voluntarily, autonomously, without pressure of any kind, without using it as a condition for submission to other procedures or benefits, and without coercion, threats, or disinformation; and that it is full and informed. See id. at paras. 176, 181, 189. The first element requires that informed consent is granted prior to initiating any medical act, which implicates that it is impossible to obtain after a medical act has been finalized. See id. at para. 176. The Court recognized that exceptions may apply in cases where there is urgency or where there is an emergency situation given that a patient’s life is in immediate danger. See id. at para. 177. However, the Court specifically stated that the risk of preventing a future pregnancy cannot be characterized as an urgent situation or an emergency. Thus, the exception was not applicable in this case. See id. at paras. 177-78. The second element requires that the person undergoing the medical procedure give his or her consent. In cases of sterilization, the Court considers that only the woman undergoing the medical procedure has the power to grant such consent—no third party can make this decision, including medical staff or a partner. See id. at para. 182. If she is not able to make this decision, then the procedure must wait until she is able to consent. See id. at para. 182. Importantly, the Court noted that consent cannot be considered “informed consent” if it is granted or solicited while a woman has just given birth, or is under epidural anesthesia, surgical stress, or lying in an operating room. See id.at para. 183. Further, given that consent is derived from the concept of liberty and autonomy, it can be revoked at any time and for any reason. See id. at para. 184. The IACtHR acknowledged that gender stereotypes may impact women’s access to information and their ability to make informed decisions over their sexual and reproductive health. The Court warned that such stereotypes are negative and prejudicial and specifically addressed them in the case in order to reject those that impair the application of rights established in the American Convention. See id.at para. 187. The final element requires that the consent be fully informed. The Court stated that health providers must, at minimum, inform patients about the following: the diagnostic evaluation; the objective, method, duration, benefits, and risks of the proposed treatment; the possible side effects; alternatives to the treatment, including less intrusive options; the consequences of the treatment; and what can be expected to occur before, during, and after the treatment. See id. at para. 189. Taking all of these elements into consideration, the Court concluded that the State failed to obtain I.V.’s informed consent, in violation of the American Convention and the Convention of Belém do Pará. See id. at para. 256. The Court concluded that the forced sterilization of I.V., in the particular circumstances of the case, constituted cruel, inhuman or degrading treatment in violation of articles 5(1) and 5(2) of the American Convention. Its noted I.V.’s particular vulnerability as a woman and the significant impact the sterilization had on her life and health. See id. at paras. 262-70. I.V. and her representatives had not alleged that the forced sterilization constituted torture, and the Court did not discuss this question. Considering the violation of personal autonomy and reproductive liberty based on gender stereotypes in this case, the Court considered measures that would prevent similar occurrences in the future. See id. at para. 342. These included the publication of a pamphlet on women’s sexual and reproductive health that includes the requirement of informed consent and the adoption of educational and training programs directed at medical students and medical professionals about informed consent, discrimination based on gender and gender stereotypes, and gender violence. See id. at para. 372. The Court ordered Bolivia to institute these training programs for all medical staff and students within one year. See id. at para. 342. Importantly, this obligation extends beyond public hospitals to also include private facilities. See id. at para. 341. In the early 190s, I.V. and her family moved from Peru to Bolivia, where they were granted asylum based in part on I.V.’s physical, sexual, and psychological mistreatment at the hands of the Peruvian anti-terrorism agency. See id. at para. 61. Following the tubal ligation in 2000, which I.V. maintained she learned of only after the fact, she pursued various complaints before the medical regulatory bodies, resulting in administrative proceedings against the medical personnel involved which eventually concluded – in spite of prior findings concerning irregularities and the failure to obtain written consent – that I.V. had consented to the procedure. See id. at paras. 72-90. Peruvian authorities initiated a criminal process against the doctor in 2002, which I.V. joined as a civil party, that concluded four years later when the Bolivian courts declared the proceedings time-barred (albeit due to delays caused by the judicial system itself). See id. at paras. 92-113. I.V. submitted her petition to the Inter-American Commission on Human Rights (IACHR) in March 2007, through the Bolivian public defender (Defensor del Pueblo), and was thereafter represented by the non-governmental organization Derechos en Acción. In 2008, the IACHR published its admissibility report, finding the petition admissible with regard to possible violations of articles 5(1), 8(1), 11(2), 13, 17, and 25 of the American Convention and Article 7 of the Convention of Belém do Pará. The IACHR issued its merits report on August 15, 2014, finding Bolivia in violation of the American Convention and the Convention of Belém do Pará. See IACHR, Merits Report No. 72/14, Case 12.655, I.V. (Bolivia), 15 August 2014, para. 186. It found Bolivia responsible for violations of the articles referenced in its admissibility report. Notably, the Commission did not analyze, or conclude, whether there were violations of Article 11(1) (respect for honor and dignity) or 7(1) (liberty and security) , of which the Court later found violations. The Court held a public hearing in the case in May 2016, during which it heard testimony from witnesses, including the doctors involved, and experts. Following that hearing, several organizations including IJRC submitted amicus curiae briefs to the IACtHR to guide its analysis in this landmark case. For more information about the Inter-American system, the human rights of women, and the international prohibition on torture, visit IJRC’s Online Resource Hub. Read the amicus curiae brief submitted by IJRC and the International Human Rights Clinic of Santa Clara University on IJRC’s website. The other amicus curiae briefs submitted in the case can be accessed, in Spanish, on the website of Derechos en Acción.